Essential points and some practice questions on rotational motion have been discussed on this site earlier. 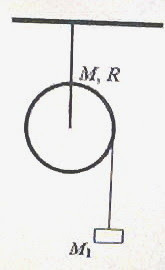 You can access all posts related to rotational motion on this site by clicking on the label ‘rotation’ below this post. 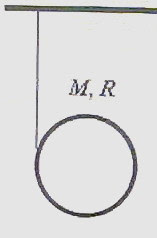 A solid cylinder of mass M and radius R has a light inextensible string wound round it. The free end of the string is tied to a rigid support (Fig.) and the cylinder is released from its state of rest. (a) Determine the acceleration ‘a’ of the cylinder as it moves down, unwinding the string. (b) Determine the acceleration a1 of the mass M1 in terms of the given parameters. (c) In terms of the given parameters obtain the angular acceleration of the cylinder when the mass M1 moves down, unwinding the string. (d) Determine the kinetic energy of the cylinder at time t.
Try to answer this question which carries 15 points. You have 15 minutes at your disposal. I’ll be back with a model answer for you shortly. Meanwhile find some useful multiple choice questions with solution in this section at physicsplus.